Many of us who eat ketogenic diets refer to homemade mayonnaise as “ketonnaise.” It is one of the luxuries of our very-low-carb style of eating that we can have this beautiful stuff. 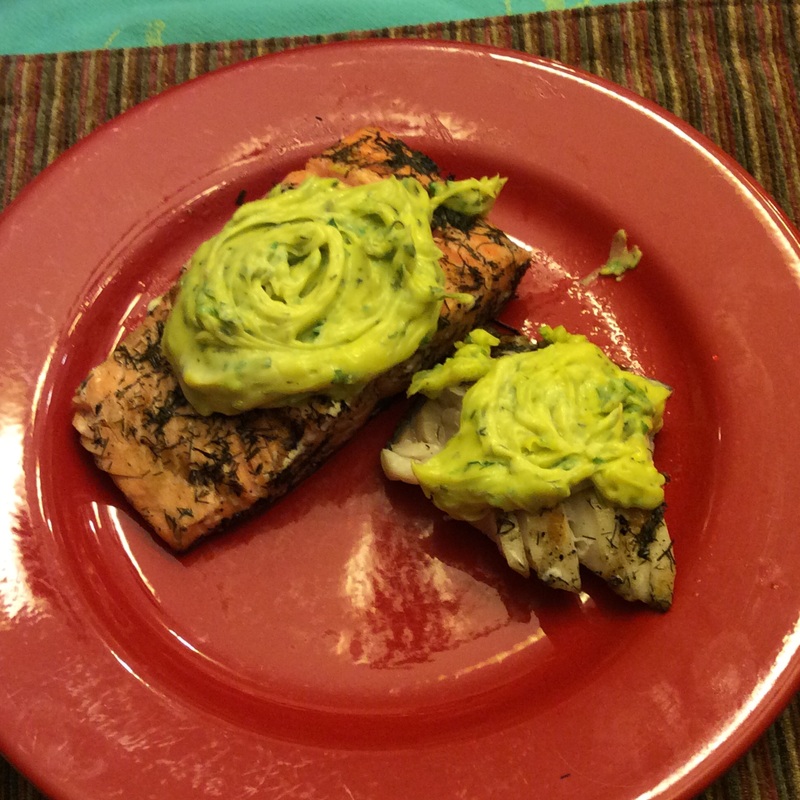 This time of year, the garden is full of wonderful ways to flavor it, and one of my favorite things to do with it is put a luxurious dollop on top of grilled sockeye salmon, as you see above. You will have to make your own decision about eating raw eggs. I use my own backyard eggs, and if I am expecting to feed others, I either pasteurize the eggs in my sous-vide cooker or let my visitors make their own choices with full disclosure. Don’t ever feed raw eggs to the elderly, children, immunocompromised people, or the unsuspecting in general. In my opinion this is best made with a Mini-prep. It gets so thick that stick blenders can’t handle it. The basic mayo is very simple. Have 1.5 cups of oil ready. I use a light-flavored olive oil or equal parts each of full-flavored olive oil and MCT oil (a fraction of coconut oil that’s liquid at room temp.) Put four egg yolks and a teaspoon of salt in your Mini-Prep food processor. You need a small one so that the mixture reaches the blades. Start the food processor running, and very slowly drizzle in the oil. The Cuisinart Mini-prep has a little runway and hole in the lid for exactly this purpose. You will start to hear the thickening mayonnaise slap against the sides of the bowl. Last thing, put in two teaspoons of fresh lemon juice. When it’s done, turn out into a colorful bowl and put in the refrigerator for now. Now the fun starts. What do you want it to taste like? For standard use I love a handful of chopped parsley, some tarragon, cutting celery, and a little thyme, a handful of chopped chives, a few large arugula leaves chopped, and the white part of a good-sized stalk of green garlic chopped finely. I usually add a smashed anchovy filet too. A meal that leans Mexican might want lots of cilantro and a little epazote and garlic. Somewhat Southeast Asian? Consider a little green curry paste and a goodly amount of chopped rau ram and a chile, chopped. Add your chosen herbs and fold in well. Taste to correct seasoning. The large amount of oil blunts flavors, and you may need more herbs and salt than you think. You can put it on broiled meat, chicken, and fish, spoon some on top of grilled shrimp, dip veggie sticks in it, or if you aren’t ketogenic it is superb smeared on chunks of baguette. Eat happily. This is an occasion for high-class piggery, not portion control. It will last a day in the fridge but, in my view, not more than that. I have read one cook online insist that it will keep safely for over a week when chilled, but I wouldn’t chance it. 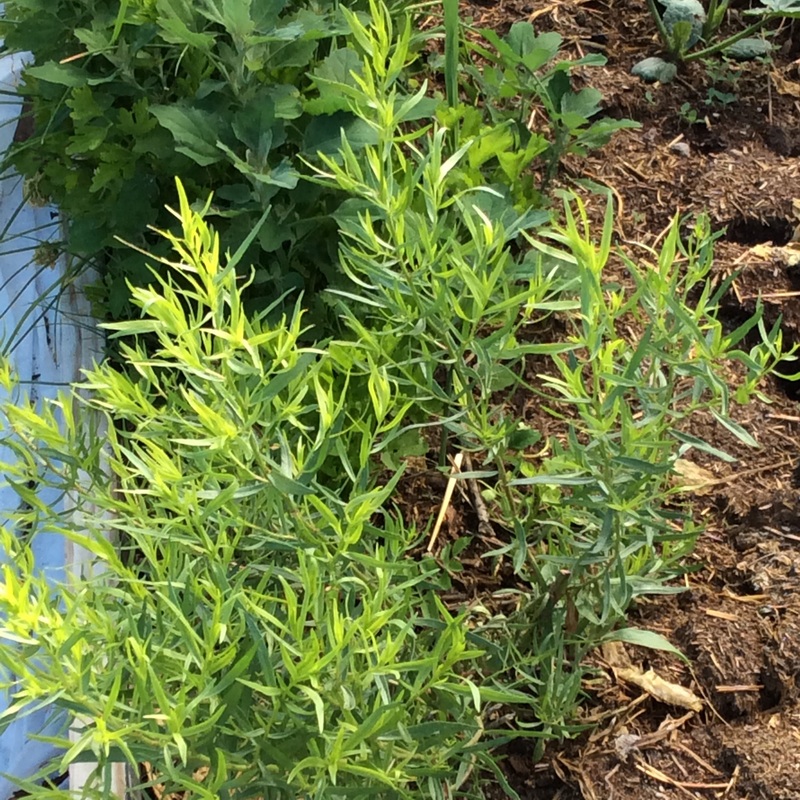 Tarragon goes crazy in late spring so let’s make use of that tender growth.